It was probably the ugliest couch I had ever seen. Gold and olive green, it was bursting at it’s polyester seams. It was obviously in need of some serious TLC but Lindsey and I were in no position to complain. Lindsey and I had been friends for seven years, ever since I moved into the Sandy neighborhood that our parents called home. Bus rides to school and a mutual love for The Beatles made us inseparable from the time we were in seventh grade until now almost nine years later. Here we were at the age of 21 about to get our first apartment together. It was 2001 in downtown Salt Lake City and all we could afford was a little one bedroom on the second floor in a vintage house that had been converted into apartments. Sharing a bedroom, even though it was large, was going to be interesting but the $350 price tag was perfect for the two of us. Plus, it had the cutest little breakfast nook off the tiny kitchen. All of our furniture was hand-me-downs and freebies, including the couch. Lindsey’s grandmother’s neighbor had a couch we could have. 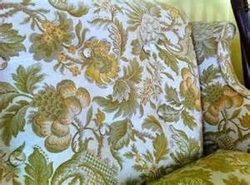 When we went to go pick it up the first thing you noticed about the couch, after the lovely colors, was the stench. It had been sitting in a garage for more than six months and smelled very distinctly of cat urine. As Lindsey and I picked up the couch to load it into the truck we borrowed from my dad, I heard Lindsey scream. “EEEKK!” At this point she dropped her end of the couch, forcing me to drop my end as well. “What?! Why are you screaming?” I asked her. “Ummm, check out under the couch,” Lindsey said. I looked at the space on the garage floor that had been previously occupied by the couch. Two elongated oval grey furry mounds were imprinted in the concrete floor with greasy halos from some kind of fluid that had leaked from them. “Tell me that those aren't dead mice,” I said. We stood there staring at the two dead mice and the couch. I was silently thinking that there was no way that I wanted to put this couch in our apartment. The hideous outside could be covered, the cat urine stench and now the addition of mouse carcass seemed like too much to overcome. “It’s either this or nothing,” Lindsey said. I sighed and then reluctantly agreed that we couldn't afford anything else. Lindsey was the dominant one in our friendship. I had always been one of those people that is very giving. I tended to get stepped on a lot because I would do anything for anyone. You could also say that I didn’t have much of a backbone when it came to standing up for myself. When I moved into the neighborhood I discovered that there were abundance of girls my age to be friends with. One of the reasons I gravitated to Lindsey was I liked that she was a little bit different than the other upper middle class girls around. Lindsey was quirky and dressed like she was from another era. I was also extremely jealous of her long naturally curly hair. One of my favorite memories of her is getting checked out of school early on my 15th birthday so that Lindsey and I could go see the laser Beatles show at the Hansen Planetarium and then go the the ZCMI mall where there was an exhibit of famous photographs taken of the Beatles. We rode the same school bus all through middle and high school, joined choir together, and spent most of our school dances in the same groups. After being friends for so long we were finally having the chance to be roommates. A main reason we had chosen this particular apartment is that it didn't come with a contract. Lindsey was engaged to be married and so when she got married in six months we would both be moving out. Sharing one bedroom was not ideal but Lindsey’s family had moved to Arizona and I was moving back to Salt Lake after attending Utah State University in Logan. Even though it would only be for a short time I was just coming from living with roommates who were pretty awful to me so I was excited to move in with a friend. We decided to keep the couch and so in it went to the apartment. After we poured what seemed like gallons of Febreze onto the couch and covered it with a sheet it didn't seem all that bad as long as you forgot that we had found dead mice under it. We put our matching twin beds in opposite corners of the one bedroom and started to add touches that made the apartment feel like home. Curtains in the nook, a plant in the turret window and candles on the ledge near the claw foot tub. Lindsey was the first of my friends to take the plunge and get married, but not the only wedding that I would be attending in 2002. My younger sister had recently gotten engaged as well which was causing me a little bit of stress. My sister and I were only 15 months apart in age and fairly competitive. I knew that she would get married before me, she had always dated more than I had but I was still feeling the pressure of not getting married before her. I was struggling as well because I felt left out from my sister’s wedding planning so when I realized that I could throw Lindsey a wedding shower I decided to make it the best wedding shower in the history of wedding showers. Perhaps I was overcompensating but I threw myself into planning. I made each invitation by hand in the shape of the black and white clappers that they use on movie sets. I had decided that the theme for the shower was “A Night At the Movies.” Guests were supposed to bring a copy of their favorite movie and a gift that somehow related to that movie. If your favorite movie was Sleepless in Seattle you could bring bedding, for The Perfect Storm you could bring an umbrella stand. Our apartment was too small to host, but luckily my parents had offered to let me host at their house. I had the menu all planned, baked brie with apricot jam, mini quiches, strawberry lemonade slush, all homemade of course. Two months after we moved into our apartment Lindsey and I started to have some differing opinions about a pretty major issue. I was not a fan of Lindsey’s fiance spending the night at our apartment. Especially since he was not staying on the couch and Lindsey and I shared a room. It was extremely uncomfortable to share a room with the happy couple. As a pretty timid person I was finding passive aggressive ways of dealing with my anger. I was purposely leaving dishes in the sink, and taking long showers because I didn’t have the confidence to confront them directly. Shortly after the invitations for the bridal shower were mailed Lindsey approached me about them. “I’ve decided to change the shower,” she said. I was dumbfounded. “What do you mean?” I asked. Lindsey replied, “Well, I’ve already called everyone and instead of having it at your parent’s house we will be having it at my aunt’s house. And instead of the movie thing I told everyone to forget the theme thing.” In typical fashion I didn’t respond. I didn’t tell her how much time I had spent hand making the invitations, or that she was being disrespectful by going behind my back before discussing it with me. I did neither of those things. I simply allowed her to do it, even though it made me feel awful about myself and angry with her. I went to the wedding shower at Lindsey’s aunts house. The one that I had initially been in charge of, the one that I ended up having no part in the planning of. I pasted on a smile and avoided the questions of why the location had been changed. All the while feeling inside like a very dirty doormat. I was miserable with the living situation. Originally Lindsey’s fiance Jared had been staying at our apartment about once a week. After two months it had increased to three and four nights a week. I felt trapped. I was too meek to stand up for my rights as a friend and as someone who paid half the rent. It would have been different if we were in separate bedrooms, she can do whatever she wants. But every morning that he stayed over I was reminded of how little respect my long-time friend was showing me. I became angry, withdrawn and continued to let my emotions fester. Two days before her wedding Lindsey moved her stuff out and into a storage space. The newlyweds would be moving to Logan after the honeymoon and couldn't get into their new apartment yet. I had to be out of our shared apartment 5 days after the wedding and would need to do the final walk-through with our landlord by myself since Lindsey would be on her honeymoon. I wanted to throw the ratty old couch we had been using out, but Lindsey asked if I could move it out for her and store it at my parent’s house until they got back from their honeymoon when they would come pick it up. In true submissive fashion I agreed despite the inconvenience it would place on me. Not only was I moving out of our apartment, but I was also starting a new job and night classes at the community college. I got my neighbor across the hall to help my youngest sister and I move the couch out the apartment at which point the neighbor wanted to know why we were saving this ridiculous mess of a couch. Because I was moving back in with my parents I wasn't going to have anywhere to to put the couch and my dad also forbid me to put it anywhere near the house so we ended up storing it in the 15,000 square foot industrial building that my parents ran their business out of. After two weeks I knew that Lindsey and her new husband should have called me to pick up the couch so I called them to ask about it. “Hello?” Lindsey’s husband Jared had picked up the phone. “Hi, it’s Danica. Are you guys settling into your new place?” I asked. “Ok, I was just wondering when you guys were going to come pick up the couch. My dad needs the space at work.” My statement was followed by a few beats of silence before he answered. “Sure. I’ll wait to hear from him,” and before I even finished Jared had hung up the phone. It was another week before I finally heard from Jared’s dad on a Friday night. He wanted to pick up the couch the next day. I explained to him that my parents would be at work from six a.m. until noon and so they would need to be there between those hours. Jared’s dad agreed and the next day my dad called me at 11:59 a.m. to tell me that no one had shown up yet to get the couch. I hadn't saved Jared’s parent’s phone number so I called Lindsey instead. I called her cell phone but Jared picked up again. After explaining that my parents would need to leave soon, Jared conferred with someone in the background (I assumed it was Lindsey) then told me to leave the couch out back so that his parents could stop by later when no one was there. I agreed but reminded him that it was supposed to rain that night. Jared assured me that the couch would be gone later that night. Monday morning when my dad got to work he called me to let me know that the couch was still out behind his building and that it indeed had rained over the weekend. At this point I was tired of the whole thing. I felt like since the moment we had decided to acquire the couch it had been a bane on my existence. In reality I know that the couch wasn't my problem, just my degrading relationship with someone that I had considered my best friend. I attempted to call Lindsey again and got no answer so I left a message. My dad asked me what I wanted to do with the couch because he didn't want to bring it back into his building. He offered to throw it in the dumpster for me. I told him that I would make another effort to reach Lindsey. After two more phone calls and reaching no one I gave up. Two months after we had moved out of our shared apartment I hadn't heard anything from Lindsey. I had paid the full amount on our last months utilities wondered if I was ever going to see my half of the money back, probably not. I came home after an eight hour work day in August that had left me frustrated only to then sit through a four hour class at the community college. I was walking through the door of my parents house when my phone rang. It was Jared. “We need the couch now.” he stated. “What about the couch?” Jared persisted. “It’s in the same place it was a month ago when your dad was going to come get it.” I replied. “It’s still outside?” Jared’s voice started to get a little louder. “It’s rained a couple times since then.” I could hear the exasperation in Jared’s voice. I could also hear Lindsey talking in the background. “Yeah, I know. We were just getting ready to throw the bits and pieces of the molding couch into the dumpster.” I explained. Jared asked me to hold on. I was silent as I heard the whispering conference going on in the background. It was a couple of minutes before he finally came back on the phone. “Well, you owe use $100 for the couch then.” he stated. I was flabbergasted. “I’m sorry, what?” I exclaimed. “Well, the couch is ruined and we can’t use it now.” Jared calmly explained. “Wait, what?” I said again. “We don’t have a couch because of you so you will need to pay us the money to replace the couch.” he continued. At this point I was speechless and starting to cry. I couldn't believe it. Where they seriously asking me to pay them $100? I was so frustrated that I couldn't keep talking. I told Jared that I couldn't talk right now and that I was going to have to call him back. “Ok, but I don’t want to have to sue you over this.” That was the last thing I heard him say as we both hung up the phone. I sat at the kitchen table after Jared hung up for a good twenty minutes before I did anything. How could this possibly have gotten worse? I started to think about all the things that I had done for Lindsey in our years of friendship. Then I started to ponder the last few months of our so-called friendship and started to get angry. I started listing in my head all of the reasons why the couch was not worth any money at all, let alone $100. I got myself so worked up that I finally got out a piece of paper to write things down. Any time I had tried to stand up for myself in the past when it came time to actually confront someone I would lose my nerve and end up backing down. I decided that was not going to happen this time. Those two had been taking advantage of my submissive nature for months. I didn't speak up when my personal space was being occupied by more people than it should have been, I didn't say anything when Lindsey hijacked her wedding shower, plus I still hadn't seen any money for utilities, I had cleaned out our apartment by myself and she hadn't even bothered to call me since the wedding. Every conversation I had had since then had been with her new husband. I took the list I made of everything that had upset me in the last few months and typed it up on the computer. I wasn't going to let them walk all over me anymore. I printed out my list of talking points and braced myself to make the phone call. Jared answered the phone again and I started out by explaining that I would not be paying them any money for the couch. I laid out all of my reasons including that the couch had been free in the first place, and a piece of crap. I then continued to tell Jared that I didn't appreciate how they had taken advantage of me. Jared tried to interject a couple of times but I just kept going. I knew that if he started talking I would lose my nerve. I then explained that should they choose to sue me over the couch I could produce witnesses, including a neighbor and our landlord, to the general state of the couch in our apartment, what it looked like when it was moved out and that it was definitely not worth any money. Furthermore I had given them plenty of opportunities to retrieve the couch and it was their responsibility to make arrangements to get it in the first place since I had been doing them a favor. I brought up Lindsey’s unpaid half of the utilities and my general feeling of disbelief that they were acting this way. Jared’s first reaction was to try and negotiate the $100. He said I should pay them half of that. I simply stated no and my no must have been convincing enough that he didn't try to talk me down any further. I sat in silence for a full two minutes before I got a response. “Fine, but don’t ever contact us again.” was Jared’s retort. “I don’t think that will be a problem.” I said and then disconnected the call. I felt a strange euphoria after hanging up the phone. I had finally done it, I had stood up for myself. Yes, I had to write everything down, but now Jared and Lindsey knew that I would not be their doormat anymore. For the first time I felt confident. I found myself sitting up straighter. I was no long Atlas carrying the weight of the entire world on my shoulders. At the age of 22 I had finally discovered that I didn't need people to like me. Sure, it was nice, but not at the expense of my self respect and dignity. It was okay to say no. I lost a friend while making this discovery but upon reflection I realized that this person that I had invested so much time and effort into was not a very good friend. Not once had she shown me the same consideration and thoughtfulness that I showed to her all the time. I could still be a good person and not let people walk all over me. That experience was the beginning of a brand new me. I never did hear from either of them again, and that is just fine by me. It was a defining moment in my life. When it came down to defending myself I was more likely to do it after that experience. It doesn't mean that it was an overnight change, for years I would write things down before going into any situation that may be confrontational. But never again was I unaware that friendship should always be a two-way street.